This workload is a fibe minute HDV. The input file is encoded in Mpeg format. Video encode parameters are 23.9mbps, 1920×1080, 29.9fps. Audio encode parameters are 384 kbps, 48kHz, 2channel, mpeg audio version 1 layer 2. File size is 128MB. The workload is encoded into h.264 output format using the preset – high profile. 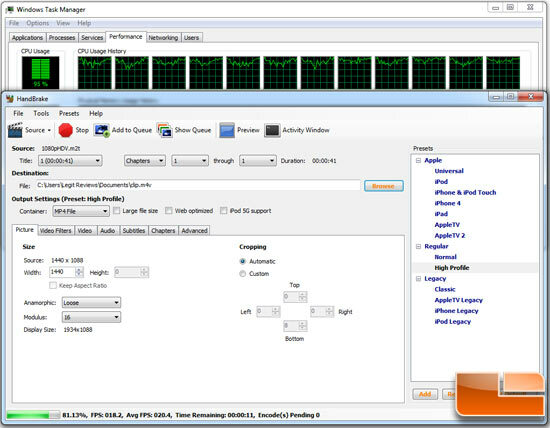 HandBrake version 0.9.9 was used for benchmarking. 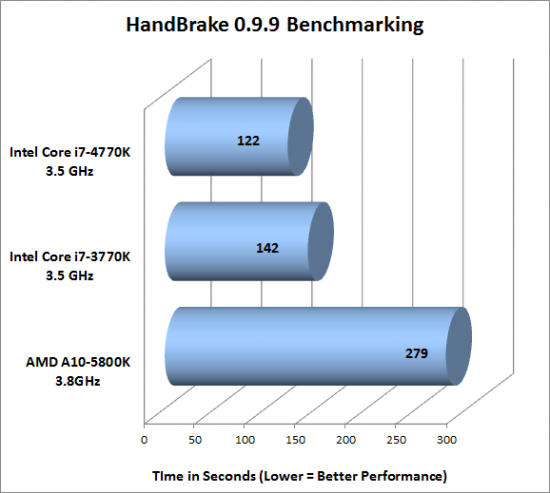 Benchmark Results: HandBrake version 0.9.9 showed that the Core i7-4770K “Haswell” processor was able to complete the benchmark 20 seconds faster than the Core i7-3770K “Ivy Bridge” processor. This is a nice 14% performance improvement doing a task that most desktop PC users do today at home.